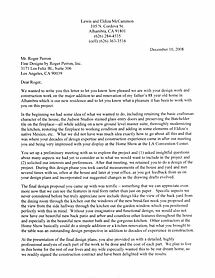 McCammon » Roger Perron Inc.
We wanted to write you this letter to let you know how pleased we are with your design work and construction work on the major addition to and renovation of my father’s 88 year old home in Alhambra which is our new residence and to let you know what a pleasure it has been to work with you on this project. In the beginning we had some idea of what we wanted to do, including retaining the basic craftsman character of the house, the Judson Studios stained glass entry doors and preserving the Batchelder tile on the fireplace—all while adding on a new ground level master suite, thoroughly modernizing the kitchen, restoring the fireplace to working condition and adding in some elements of Eldiza’s native Mexico, etc. What we did not have was much idea exactly how to go about all this and that was where your decades of design expertise and construction experience came in after our meeting you and being very impressed with your display at the Home Show at the LA Convention Center. You set up a preliminary meeting with us to explore the project and (1) asked insightful questions about many aspects we had yet to consider as to what we would want to include in the project and (2) solicited our interests and preferences. After that meeting, we retained you to do a design of the project. During this design phase you took careful measurements of the house and yard and met several times with us, often at the house and later at your office, as you got feedback from us on your design plans and incorporated our suggested changes as the drawing drafts evolved. The final design proposal you came up with was terrific – something that we can appreciate even more now that we can see the features in real form rather than just on paper. Specific aspects we never considered before but truly appreciate now include things like the view of the back yard from the dining room through the kitchen out the windows of the new breakfast nook you proposed and the view from the side hallway through the kitchen out the garden window which you positioned perfectly with this in mind. Without your imaginative and functional design, we would also not now have our beautiful new back patio and arbor and countless other features throughout the house and especially in the beautiful new master bath and the gorgeous kitchen. Other contractors at the Home Show basically could do a simple addition or a kitchen renovation, but what you brought to the table was an outstanding design perspective in addition to decades of experience in construction. At the presentation of the final design plans, you also provided us with a detailed, highly professional analysis of each part of the work to be done and the cost of each part. We plan to live in this home for the rest of our lives and my wife especially wanted this to be our dream home, so we readily signed the construction contract and have been delighted with the results. You and your architects and engineers were most skillful at negotiating the complex permitting process and committee approval hearings which were especially complicated in Alhambra. On the construction end, you have a mostly highly skilled and delightful staff (especially Mark Edwards, your foreman) and have developed a long term relationship with the best group of subcontractors I have ever seen. I can’t say enough about the expertise of the painters, your tile workers, the Pacific Pavingstone staff who did the driveway and sidewalk, the electricians, the plumbers, the roofers, etc. Your long relationship with these subcontractors makes it easy for you to get exactly what you need out of each of them and to get any clean up items done where needed. The craftsmanship and skill of your own staff on the cabinet work is without equal and our new cherry cabinets are perfect and beautiful. At one point, when you thought that the square cabinet corner under the curved corner of the granite slab countertop didn’t look right, you at your own expense had Mark craft a terrific curved wood cabinet corner to match. That says a lot not only about the expertise of your staff, but also about your own concern for the job being done to a high standard and with a concern from what looks right from a design standpoint. Many times along the way we added items or changed a few things. You were always most cooperative in working with us on this and on those items where minor corrections were necessary. One of your staff members went with us to select tile patterns, designs and colors and to pick out appliances and plumbing fixtures and other accessories and you accompanied us personally on some visits to one of the tile shops. Another aspect that needs to be mentioned is all the support you gave us with the paperwork in the difficult process of being approved for a construction loan (during the middle of the 2008 bank meltdown—no easy task) and with the inspections and paperwork for the “draws” on this construction loan. This loan was necessary for some extra items we had added to the project, including the landscaping, extensive paver work and additional items in the house. This process was another area is which your computer skills came in very handy. Overall, this project has given us all new systems (plumbing, electrical, HVAC – resulting in a drop in insurance costs), new appliances (many Viking built-ins), added the master bedroom, its walk-in closet and master bath, completely renovated, enlarged and relocated the other two bathrooms, enlarged and completely modernized the kitchen (going down to the studs and adding a breakfast nook) and laundry room, rebuilt the firebox in the fireplace, replaced the old cracked masonry chimney with a modern flue so that the fireplace can be used again, widened the upper hallway, extended the lower hallway, refinished all the wood floors, tiled the porch, installed six beautiful new wood doors on the closets for the two upstairs bedrooms, added the new tile back patio and its arbor, added extensive custom tile work throughout the house and on the stairs inside and out, all new light fixtures (some custom designed), a new roof and rain gutters, beautiful new paint inside and out, custom granite countertops, all new pulls and designer plumbing fixtures, extensive new landscaping, etc. This is truly our dream house and we want to thank you ever so much for making it possible.